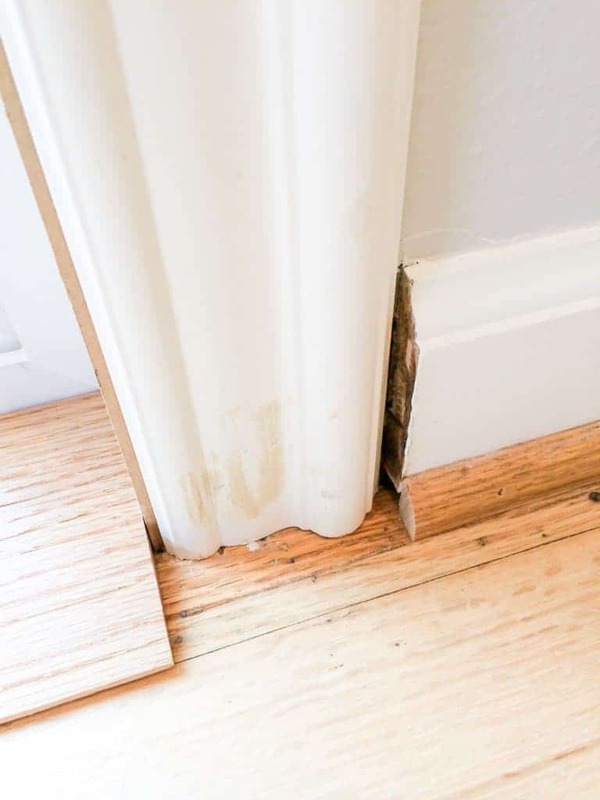 Stumped on how to transition between your baseboards and door trim? 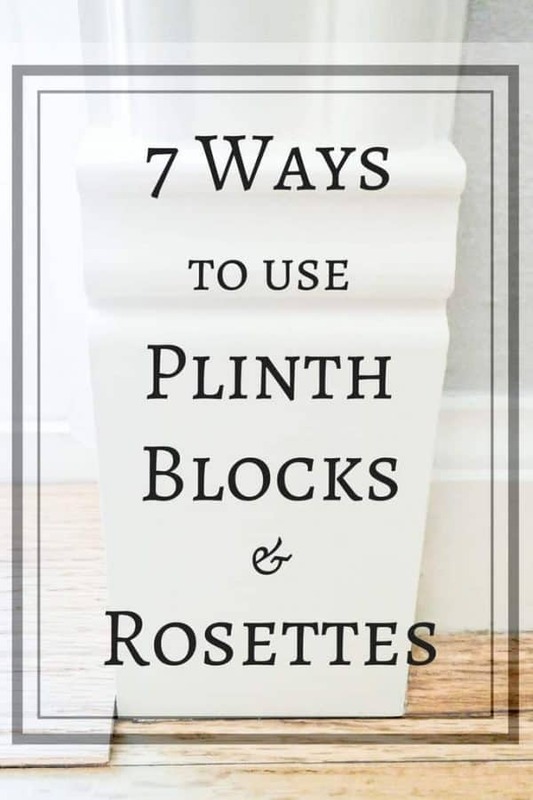 Try a plinth block! This tutorial will show you how to install them for a finished look. Adding new doors to an old house can be a challenge, especially matching the trim. A plinth block can be the perfect solution for these transitions. 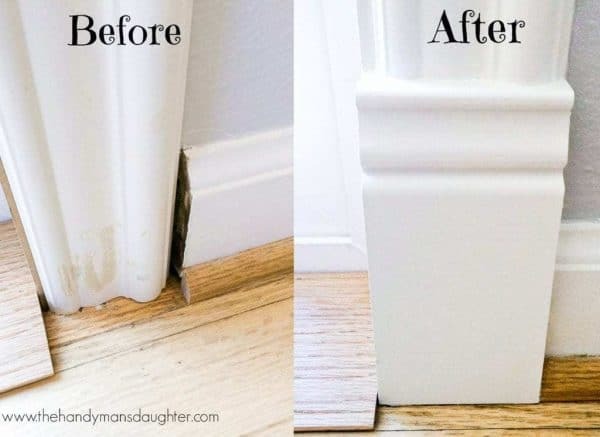 This little piece of molding can completely change the look of your baseboards and door casings! I’ll show you how to install a plinth block to give your door trim a whole new look. 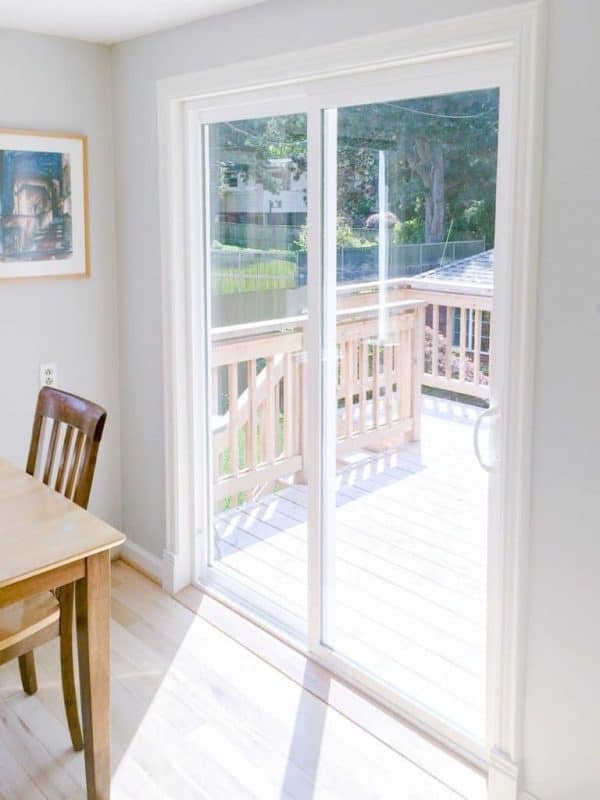 As part of our deck remodel, we turned a window into a sliding glass door. Our contractor specialized in exteriors, which meant the work done on the interior door trim wasn’t exactly stellar. Yuck! Now the edge of the baseboard was exposed, as well as the slightly damaged hardwood floor. The entire transition just looked wrong! I decided to take matters into my own hands and fix it myself. Not only was the door trim a mess, but the threshold had some issues as well. Something must have warped, because there was a 3/8″ gap in the center between the back edge of the threshold and the door. The gap was too big to fill in with clear caulk, so it was just a great place for grass and crumbs to get trapped. Luckily, the threshold hadn’t been nailed down yet, so I brought it down to the workshop to give it a little trim. I used a block plane to shave off a little bit from each end of the back edge, leaving the center intact. It took a few trips back and forth to test the fit before I finally got the threshold to lie flat against the new door. 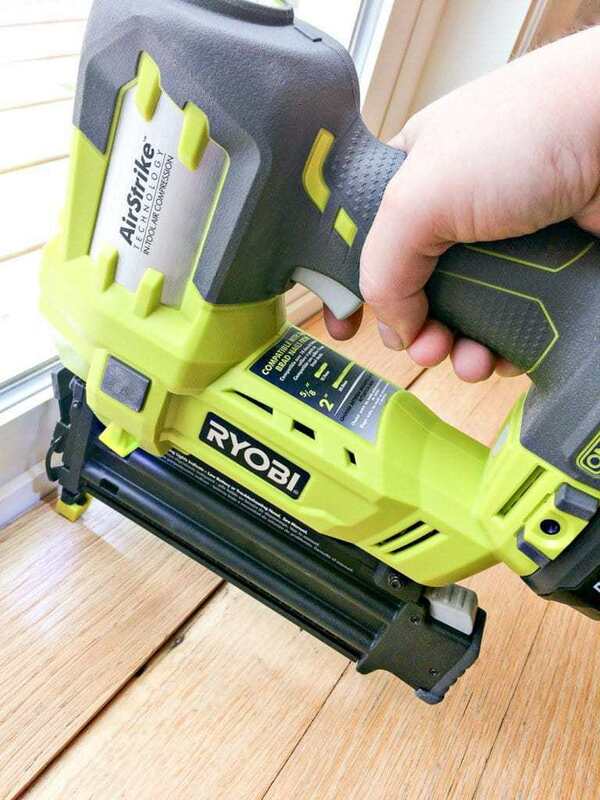 Once the gap was gone, I nailed it into place using my new Ryobi AirStrike Brad Nailer. I love not having any cords or air compressor hoses to deal with. Best tool ever! Next, I wanted to find a way to improve the transition between the original baseboards and the new door trim. I carefully removed the door trim so it could be reused. 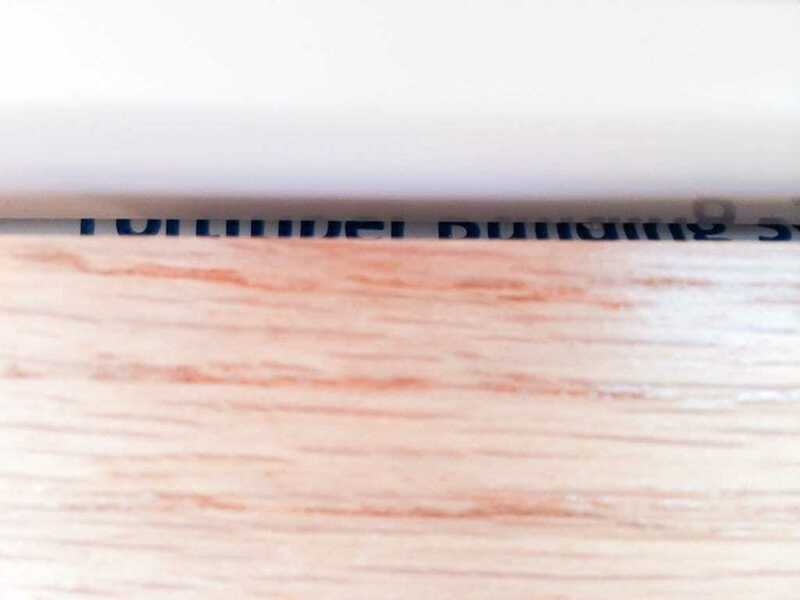 Run a box cutter along the caulk line so you can remove the trim without ruining your drywall. I found these plinth blocks among the many options on the Home Depot website. 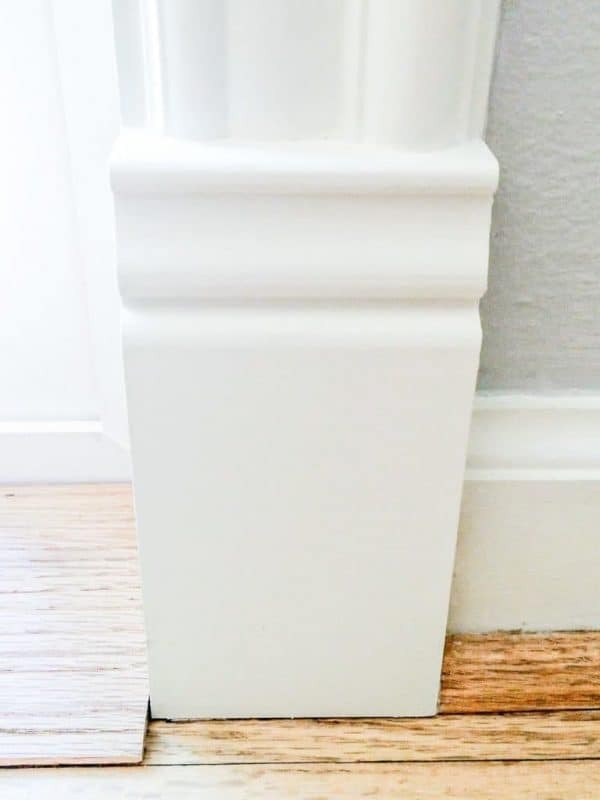 You can also find other styles of plinth blocks that may work better with your decor. The dimensions of this particular plinth block fit the gap perfectly, and it was a similar style to the original trim. I gave each plinth block a couple coats of our trim paint color, then nailed them in place. 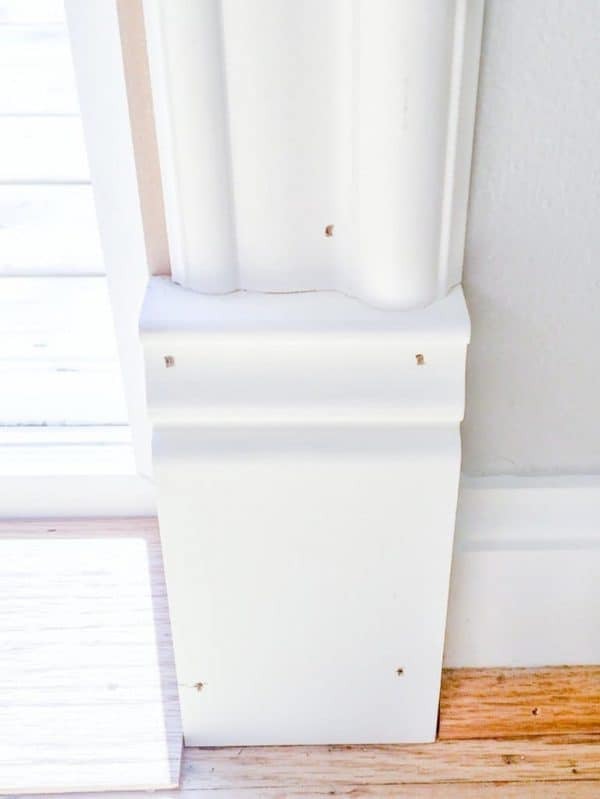 After setting the plinth block in place, I put up the rest of the trim, following this great video tutorial from the Family Handyman. I had to improvise a bit when it came to installing the top piece, because it was long and floppy and no one was home to help. Luckily, I could just open the door and clamp it in place from the outside. It was like having an extra set of hands! I reused the mitered end of the trim done by the contractor, so no mitered cuts were necessary. I just marked where the plinth block started and cut the bottom to fit. Then I lined up the outer edge of the trim with the outer edge of the plinth block, and nailed it into place. To finish it up, I spackled the nail holes, caulked all the edges, then painted everything the same trim color. I’m glad I put the extra time and effort into finishing the trim properly. A sloppy detail like that drives me crazy! It was a simple, inexpensive solution that made the whole project come together. Want more ideas on how to use these decorative elements? Check out these 7 inspiring ways to incorporate plinth blocks and rosettes into your home! 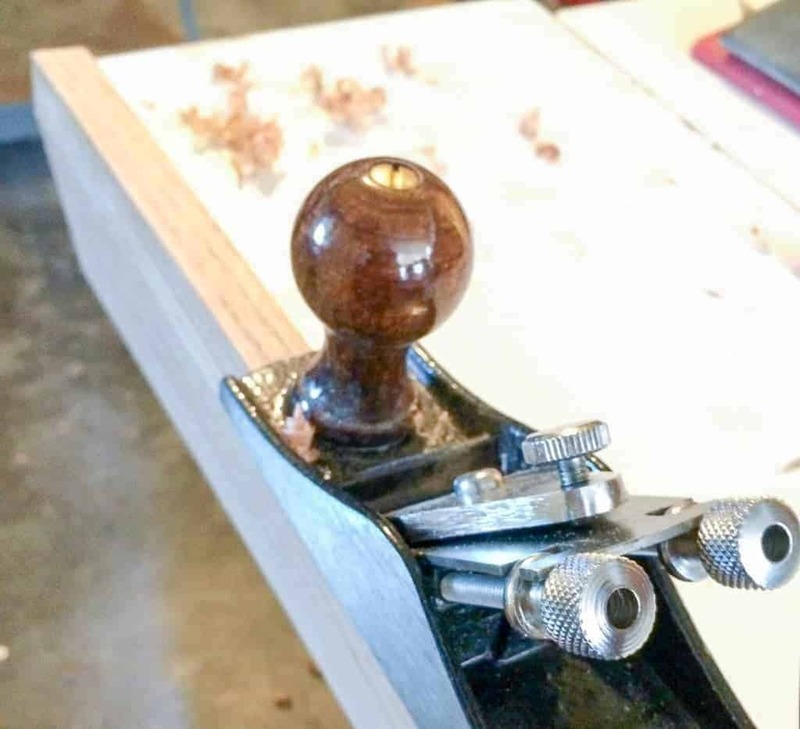 If you would like to keep up to date with my latest posts about woodworking, home improvement projects and more, you can follow me on Facebook, Pinterest, or by signing up for my weekly newsletter below. Previous Post: « Our New Deck and Door – Done! This is perfect! Very frugal and looks fantastic. Not to mention it easy to make it. Thanks so much! This was the second version of our slider’s trim, so you can always change it. I’m so glad I did! This seems a lovely touch to any home,which is quite easy to install with a maximum effect. I do a lot of work around the home so I will possibly include this tip when redecorating. Yup, it was easier than installing the actual trim, and made a huge difference. Glad you can use my tip! Cool site! You are my kind of gal.. except that my super handy husband taught me everything I know – not my dad. I really like this project, and suspect that there are a few places in the house that I could implement that! Aw, thanks so much, Jen! My husband is the opposite of handy, so if anything needs to be done around the house, it’s up to me to fix it. At least I have my dad on speed dial to talk me through it if I get stuck! What a bummer that your flooring guys messed up your trim! I hope a plinth block does the trick! I love the wall color! Could you tell me what it is? Thanks! It’s Big Chill by Sherwin Williams. This is awesome! The details are so important when you want a space to look done right. This looks so much better with the plinth. 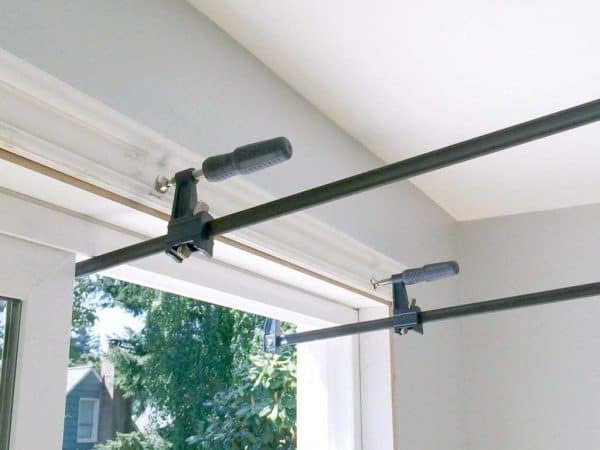 Have you ever done something similar to window trim? I haven’t, but I’m sure something like this could work on windows. A rosette might work better, especially on an upper corner. Your plinth block idea solved a real problem for me. The threshold for the entry door in the old house we live in was installed incorrectly. The vertical trim drained down onto the edge of the floor, rotting it. I will be replacing part of the floor and the inside trim. Plinth blocks will make this easier and prettier. I’m so glad I could help solve your problem! Good luck with your repair! Many people are forgoing carpet for hardwood & thus leaving trim just hanging in mid-air. This is a great solution! GREAT WORK!! The plinth blocks will be my first project ? So clever and it looks spectacular! Looks great! 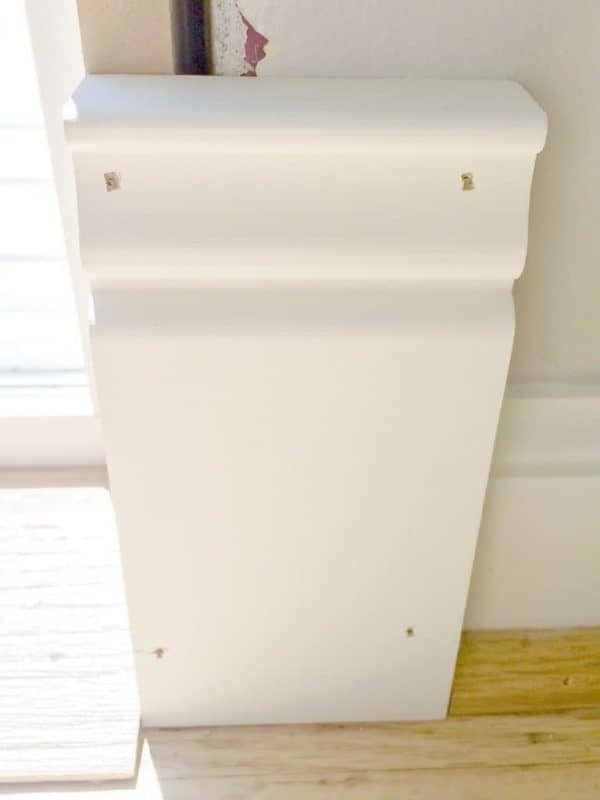 Our 128-year-old house came with plinths but I had no idea you could buy them on Amazon. Brilliant! It looks so good – like it was there from the get-go!!! I am new here. Wanted to tell you “You are Wonderful” and I love your site. I don’t have the tools or the know-how to install plinth blocks but love seeing what you have done!!!! Thank you for all the fun information! Aw, you’re so sweet! Thanks for your kind words! So I learned something new today…..I have plinth block in my house and didn’t know it. This turned out great and a clever solution to your problem.